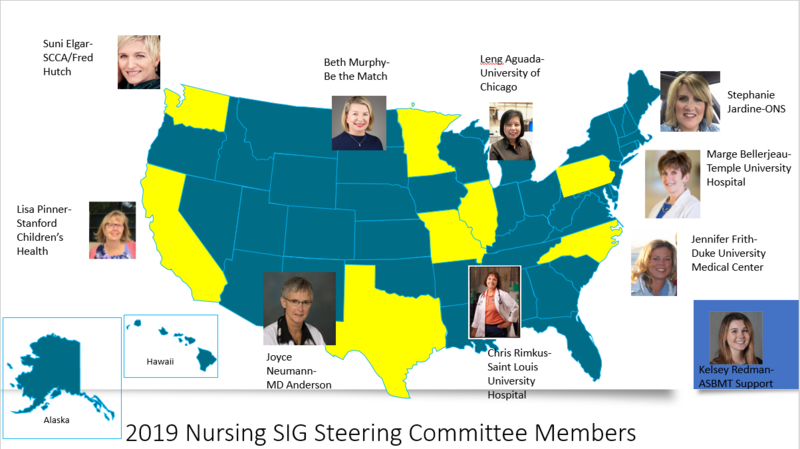 The ASTCT Nursing Steering Committee provides leadership for nurses within ASTCT and promotes nursing representation on ASTCT committees. The steering committee collaborates with the ONS Blood and Marrow Stem Cell Transplant SIG on various projects and represents ASTCT's interests on these projects. The ASTCT Nursing SIG is seeking enthusiastic and motivated nurses working in the area of Transplantation and Cellular Therapy to participate on the ASTCT Nursing SIG Steering Committee. At this time we are recruiting qualified candidates to replace the members whose terms will end in 2019. Steering Committee members serve a three-year term with the option to serve longer if elected to serve as Chair. We will also be recruiting for our working committees in the near future. CLICK HERE for application. The Nursing Special Interest Group (N-SIG) offers blood and marrow transplant nurses a forum for education, the exchange of ideas, networking, the promotion of transplant nursing, and the dissemination of best practices within the field of blood and marrow transplantation. The N-SIG collaborates with a similar group sponsored by the Oncology Nursing Society (ONS) on an annual conference focused on advancing the practice of BMT nursing. The Nursing SIG contributes to the mission of ASTCT through participation in projects and committees. To build a robust SIG, we need dedicated, compassionate, energetic and committed volunteers. We need YOU! The SIG offers opportunities to get involved in SIG projects, the steering committee, ASTCT committees and conference planning. Membership in the Nursing SIG is open to any ASTCT member. We welcome nurses functioning in a wide variety of roles, including staff nurses, nurse educators, transplant coordinators, clinic nurses and any other roles within the blood and marrow transplant program of a hospital, medical center or health care system. Read the Nursing Charter for more information on the SIG's purpose, membership and committees, including committee composition, selection and responsibilities. Are you ready to enhance your professional credibility and enjoy the feeling of personal accomplishment that comes from being certified? If you meet the criteria for applying, take the test for certification as a BMT nurse and become recognized for your specialty knowledge in BMT nursing. This comprehensive overview will enhance your ability to care for patients receiving BMT throuhgout the cancer continuum. You'll learn about resources for setting up and enhancing BMT programs, discuss advanced concepts and future directions of BMT, and take home clinical pearls for caring for pediatric BMT recipients. "Hematopoietic Stem Cell Transplantation: A Manual for Nursing Practice" is included with the course registration. This textbook, endorsed by the European Society for Blood and Marrow Transplantation (EBMT), provides adult and pediatric nurses with a full and informative guide covering all aspects of transplant nursing, from basic principles to advanced concepts. The ASTCT Nursing ListServ has been replaced with an online community. To learn more and join the conversation, click here.